The German-born photographer took this picture in 1988 for Vanity Fair. Leni Riefenstahl was a German photographer and film director who had a strategic role during Nazism: she directed Triumph des Willens and Olympia in the 1930s, extremely effective and innovative propaganda films. Said to be part of Hitler’s inner circle, she was never charged nor associated with war crimes. 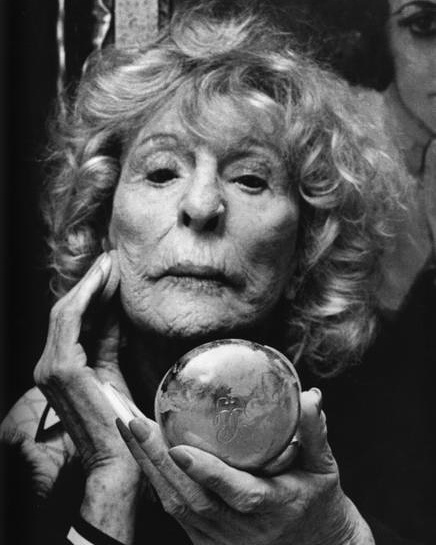 In this portrait, taken when she was 86 years old, she was holding a beautiful metal compact by Guerlain. It’s a vintage piece, probably a limited edition from the 1970s. It’s made of metal and has the trademark double Gs decorating the front. It’s quite thick and rounded, in comparison to today’s compacts, which tend to be very thin.